Hand held instrument for the measurement of Salinity and Specific Gravity (S.G.) by refractive index. Specifically designed for aquarium use for measuring the salinity of Natural Sea Water. Almost all hand held salt water refractometers available to the hobby are designed and calibrated for the testing of brine solutions, i.e. sodium chloride, and are not calibrated for the refractive index of natural sea water. Even though the largest percentage of salt in the sea is sodium chloride, the presence of other significant ions such as magnesium and calcium in natural sea water results in a different refractive index relative to that of brine. A standard salt (brine)refractometer will therefore not give the correct salinity for natural sea water(NSW)and a conversion factor must be applied. For example a 35ppt solution of NSW has the same refractive index as a 36.5ppt solution of brine. When using a normal brine refractometer the user should therefore look for a reading of 36.5pptwhen trying to achieve a reading of 35ppt for natural sea water. One of the other problems with most refractometers is that the scale displayed normallyreads from 0-100ppt when we are really only interested in the region from 30-40ppt. Our new Seawater Refractometer has therefore been specifically designed to read from 0-40ppt which gives you 2.5 times the resolution of a normal 0-100 scale. There is a lot of misunderstanding concerning the way the ATC feature works and its effect on the refractometer at different ambient room temperatures. Salinity is a measurement of a mass of salt in a mass of water and therefore does not vary with temperature however a refractometer does not measure salinity directly but measures the refractive index which is then displayed as salinity. The refractive index of a solution does vary with temperature therefore the reading that you measure with a refractometer is always temperature dependant. An ATC refractometer has a bimetal strip inside the instrument that moves the reading scale as the temperature changes to compensate for the change in refractive index. What people do not generally understand is that it is the temperature of the instrument and not the water temperature that is important as the small sample of water used for testing will equilibrate within seconds to the temperature of the refractometer. Once correctly calibrated at the set calibration temperature of 20 C the refractometer can then be used in environments where the ambient temperature and therefore instrument temperature would heat up or cool down within the range of the ATC which is between 10 and 30 centigrade. If you look at the scale above you will see that the refractometer states that it is calibrated at and displays the SG of seawater at 20 C. Most salt refractometers use this temperature and will be marked 20 C or 20/20. Calibration should always be carried out with the instrument at 20 C which is close to the average room temperature in most cases. Allow the refractometer to stand at this temperature for 30 minutes to equilibrate. The D-D refractometer is designed with a copper body which is more expensive to manufacture but responds faster to ambient temperature changes than other materials. Step 1: Clean the glass prism and translucent cover flap of the refractometer with pure or reverse osmosis water to ensure that there are no salt residues that would affect the reading. Step 2: Using the pipette dropper supplied, fill and empty the dropper a number of times in pure or RO water and then whilst holding the refractometer horizontally place a sample of the water on the glass prism. Step 3: Close the clear flap onto the sample and wait for 15 seconds for the temperature to equilibrate with the instrument before looking through the eyepiece with the prism end pointing towards a bright light source. The eyepiece can be screwed in or out to adjust the focus and compensate for individual eyesight. Note that the refractive index is also dependant on the wavelength of light too and therefore a light source closest to daylight should also be used. You will observe that the top of the view screen is blue and where it changes from blue to clear at the bottom is where the reading should be taken. If this boundary does not line up exactly with the zero mark on the scale then take the small screwdriver provided and having first removed the protective cap adjust the scale position by tightening or slackening the screw. Your refractometer is now calibrated. Note it is also possible to calibrate the refractometer using a 35 ppt reference solution however be wary of any versions that do not quote the temperature of calibration as they may be designed for use or calibration at a different temperature. Ensure that the prism of your refractometer is clean by washing the prism plate and cover plate after use each time in pure water and drying it with the polishing cloth supplied. Take a representative sample of the water from your aquarium, ensuring that you fill and empty the dropper a number of times first to rinse out any salt deposits from previous use, and then place the sample of water on the prism in the same way that was done during the calibration process. It is better to put more water on the plate and to let the cover plate push the excess away than to use a too small a volume. Allow the water to equilibrate to the temperature of the instrument for 15 seconds and then look down the eyepiece to take the salinity reading at the bottom of the blue and clear interface. One side of the scale will allow you to read the salinity and the other side the specific gravity calculated at 20 C pure water density**. We recommend that you try to get used to thinking in terms of salinity and use the salinity readings on the refractometer as this is the scale that is calibrated against the refractive index standard. SALINITY is always constant whereas Specific Gravity, although more commonly used in the hobby, is fraught with misconceptions that are explained later. Salinity as explained earlier in these instructions is generally described as the mass of salt in a specific mass of pure water and is normally expressed in parts per thousand or ppt (‰). For example 35ppt could be 35 grams of salt in 965 grams of pure water or 35 tonnes of salt in 965 tonnes of pure water - 35 units by weight in a total of 1000 units by weight. Weight is never affected by temperature. In the oceans the salinity varies from 5 ppt in the Northern Baltic Sea to 40 ppt in the Northern Red Sea with a generally accepted global average of 35ppt for NSW. The level that you keep your aquarium at will generally be determined by the type of animals that you keep in the system. Often fish only systems are maintained at lower salinities down to 29ppt as it exerts less osmotic stress on the fish whereas reef systems are normally maintained at 35-36ppt. The parameters printed for H2Ocean Pro+ reef salt are quoted at a salinity of 35.5ppt. is not an exact scale and is defined as the relationship between the density of a solution, in this case seawater, relative to the density of pure water – normally measured directly by hydrometer. As density is temperature dependant due to expansion, which changes the volume for a given mass, then specific gravity is also temperature dependant and varies according to two parameters. 2 – The temperature at which the pure water density used in the SG calculation was measured at – normally the calibration temperature that should be printed on all good scientific hydrometers. This leads to huge misunderstandings within the hobby as to what the specific gravity should be specified at within the aquarium. Most people believe that the SG of 35ppt seawater is 1.025 at 25oC whereas in reality the specific gravity measured is determined by the calibration temperature of the particular hydrometer owned by the aquarists. The specific gravity readings in the table to the left range from 1.0233 – 1.0277 however they are all correct in describing the same sample of water at 35ppt salinity. The difference between the readings is due solely to the calibration temperature which is used to set the scale for the instrument. 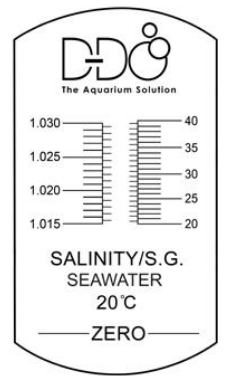 From this we can see how non specific S.G. is as a way of describing the salinity of the water in your aquarium. D-D refractometers are calibrated at 20 C and so the calculated specific gravity at 35ppt displays a reading of 1.0266. This is the equivalent to a specific gravity reading of 1.0264 for a water sample temperature of 25oC using a standard hydrometer that has a calibration temperature of 77F or 25 C.